Fig. 1. Cenosphaera minor sp. nov., p. 27. Holotype, x130, sample No 15/3. Santonian. Fig. 2. Cenosphaera sp. 1., p. 27. Holotype, x130, sample No 28/3. Turonian? Fig. 3. Conosphaera clivosa* sp. nov., p. 28. Holotype, x130, sample No 15/21 Santonian. Fig. 4. Conosphaera mammilata sp. nov., p.28. x130, sample No 16/30. Santonian. Fig. 5. Cenellipsis elliptica sp. nov., p. 28. Holotype, x130, sample No 7/2. Maastrichtian. Fig. 6. Xiphosphaera irregularis sp. nov., p. 27. Holotype, x130, sample No 16/33. Santonian. Fig. 7. Ellipsoxiphus cf. asper Rust, p. 29. x130 sample No 16/39. Santonian. Fig. 8. Cromyodruppa concentrica sp. nov., p. 29. Holotype, x130, sample No 16/46. Santonian. Fig. 9. Cromyodruppa concentrica sp. nov., p. 29. x130, sample No 15/3. Santonian. Fig. 10. Condiscus lens sp. nov., p. 31. Holotype, x130, sample No 15/1. Santonian. Fig. 11. Spongoprunum crassum sp. nov., p. 29. Holotype, x130, sample No 8/2. Campanian. Fig. 12. Spongoprunum crassum sp. nov., p. 29. x130, sample No 8/17. Campanian. Fig. 13. Spongoprunum angustum sp. nov., p. 30. Holotype, x130, sample No 8/12. Campanian. Fig. 14. Spongoprunum articulatum sp. nov., p. 30. Holotype, x130, sample No 8/6. Campanian. Fig. 15. Spongoprunum articulatum sp. nov., p. 30. x130, sample No 8/17. Campanian. Fig. 16. Trochodiscus spiniger sp. nov., p. 31. Holotype, x130, sample No 16/24. Santonian. Fig. 17. Triacticus triacuminatus sp. nov., 31. Holotype, x130, sample No 16/22. Santonian. Fig. 18. Porodiscus vulgaris sp. nov., p. 32. Holotype, x130, sample No 16/18. Santonian. Fig. 19. Stylodictya delicatula sp. nov., p. 33. Holotype, x130, sample No 28/2. Turonian? Fig. 20. Stylodictya delicatula sp. nov., p. 33. x130, sample No 28/2. Turonian? * This name, i.e. "clivosa", was given by R. Lipman later in 1968 (Lipman, R.Kh., 1968. 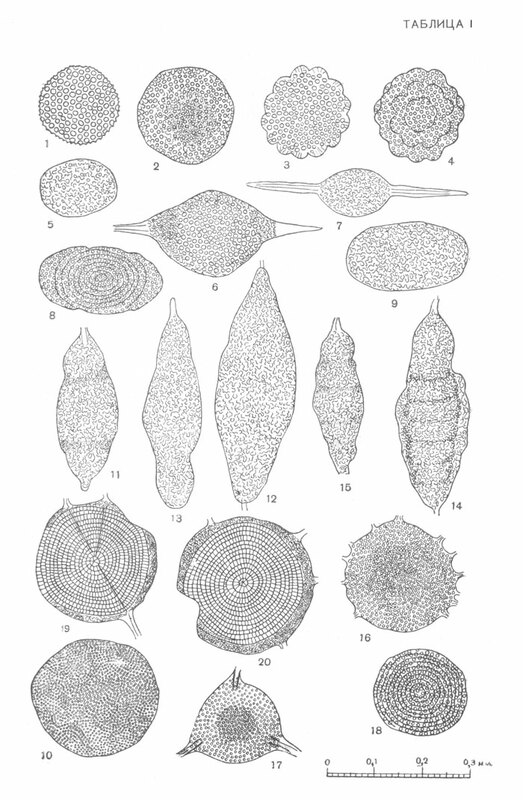 Renaming of two Late Cretaceous radiolarian species. Paleontologic Journal. Moscow. No 3. p. 102. In Russian). Firstly in the regarding publication (Lipman, 1952) this species was named as "mammilata".